To achieve their political goals, the Left makes no apologies or attempts to hide its preference for government intervention. Just last week at the United Nations climate summit, Governor Jerry Brown (D-CA) declared that the "coercive power of the central state" is needed to promote “good” public policy. The Governor professed that government regulations must force companies to do what progressives think is best. He believes there will be dire consequences if markets are allowed to run amok. Therefore, it is a moral imperative to use the power of the state. Progressives make their policy arguments in moral terms. Their political ideology is their faith and the state is their church. They believe that government is best and most trustworthy to manage our economic lives. As reported here by Reason, Jerry Brown, acting as the Left’s high priest, said, "You used the phrase 'policy.' Good policy. But I want to unpack that term a little bit. Inside the policy… You need the coercive power of government to say, 'Do this. '” The Governor expanded on his ideological dogma later in the day when he told a group of supporters to "never underestimate the coercive power of the central state in the service of good." The Left is usually candid about its approach to public policy, but it is rare for a politician to make so explicit the Left’s desire of using government to bludgeon businesses into submission. But at multiple events during the United Nations summit, Brown was thrilled to say that politicians need to be willing to use the blunt force of government intervention to control the marketplace. Jerry “Moonbeam” Brown and his disciples seek control through government action. So, if they determine capitalism hurts the poor and favors the wealthy, progressives then have the moral obligation to level the playing field. These progressive policymakers and their allies – those who created and shaped the Occupy Wall Street movement – perceive business as a bogeyman. Free enterprise is inherently unfair because it rewards some at the expense of others. Therefore, whole sectors of the economy, indeed the economy itself, must be closely regulated. A quick glance at history shows that poverty for the world’s population did not budge for the 2,000 years before the Industrial Revolution. Only after the remarkable advances in technology – like the rail road and the steam engine – did living standards begin to rapidly advance. Since the Industrial Revolution, everywhere that capitalism takes hold, national wealth increases and poverty declines. Everywhere that capitalism is rejected, people remain impoverished and poverty increases. Free Enterprise is the only system in the history of humankind to lift people – billions of people – out of poverty. Progressives may cry, “that’s history, what about today?” Is there real time, tangible proof showing how markets work better than coercion? Here’s an example from today: In the mail this afternoon, my wife received her new EMV-chip card. These leading-edge bank cards are a market response to protect consumers from fraud. 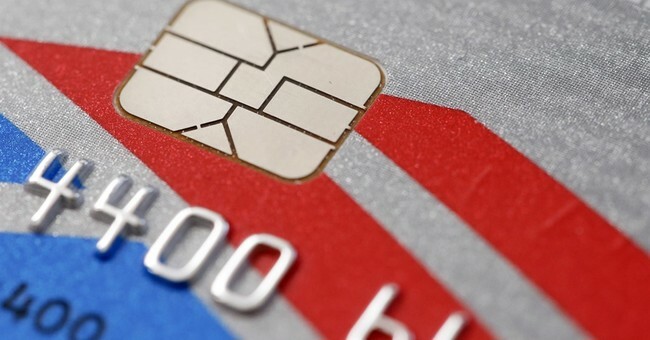 Though not a solution to all card-related cybercrime, the EMV cards are a significant, market-driven improvement. These chip cards, unlike the magnetic stripe cards we’re all used to, are impervious to counterfeiters. The Obama Administration has not issued any executive orders mandating this new technology. Senator Elizabeth Warren (D-MA) – the Left’s leading anti-market advocate – did not write a new law creating this innovation. In fact, no Member of Congress can take credit for introducing the idea as legislation, and no bureaucrat is proposing new regulations for its design. With the EMV-card, the market has triumphed without new economic rules instructing a government one-size-fits-all solution. The EMV-chip bank card exposes the fallacy that coercive government is necessary for good policy. And, its introduction into the market-place supports the case for a more constrained government. That being true, much still depends on how banks and retailers finish the job. While banks are making significant progress in issuing new cards to consumers, retailers aren’t moving nearly as fast to upgrade payment terminals. That could be a blunder with long-term negative consequences. Extended delay may invite government meddling that will stifle future innovation. Everywhere the Left has claimed the moral high ground to justify “the coercive power of the central state in the service of good,” free-market advocates must recapture that ground. Economic growth – not government intervention – is the driving force behind advances in people’s living standards. As the EMC-chip proves, market-driven technologies can improve our lives without the blunt force of the state. The extraordinary innovation that free enterprise has created since the early days of the Industrial Revolution is remarkable – miraculous really. Life expectancy has more than doubled from what it was throughout most of human history. Laptops, smart phones, personalized medicine, and even those things that might go overlooked, like a new bank card in the mail, are still transforming our lives for the better.